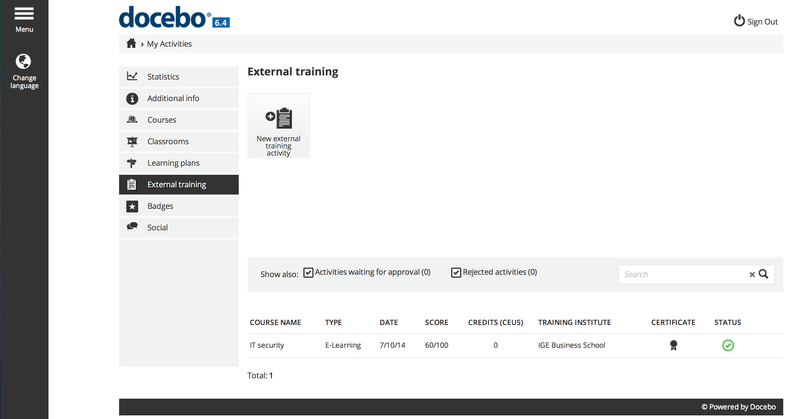 Docebo LMS Review: "Your best online learning platform." This tool is being used in all departments for all learning, as Docebo increases the motivation of employees to learn. Docebo allows me to give online courses to all employees of the company, on topics of interest such as sales, marketing, and others. Best of all, it has interfaces for video conferences, and you can track the courses. Helps learning and team training. Reduces costs in very expensive courses. The platform is based on a cloud which helps you save everything and share. You can manage and direct the courses online. Docebo is very well suited to all those companies that need to be constantly updated on issues, such as sales or technology, because through this tool you can have your person updated on specific topics. Docebo Learn is driven by artificial intelligence, which makes your work faster and easier to find. It is a very didactic tool--you can make video conferences, chat, and forums. It also allows you to evaluate the skills and knowledge of your employees. Docebo LMS Review: "Docebo Leaves Much to Be Desired and Their Support is Dismal"
Docebo is the LMS we use for our Conga University site, which supports employee, customer, and partner training. The user interface is well designed and for the most part very intuitive. Administration is fairly straight forward - I've used other LMSs that require intense concentration and pages of written notes to remember how to create and deploy a course - this is not the case with Docebo. Docebo is an open system that has many integrations. The new certification module is not very robust. To me this is typical of many of their modules/apps you can integrate into the system. to say the least, they leave much to be desired (for example, I never could get eCommerce to work properly). Support has been truly awful the last few weeks - not only am i not getting timely responses, but i am not getting helpful responses. Functionality I paid for does not work and support, when they respond, seem to be at a loss as to how to help me. Easier to customize and a more consistent experience across the product. In three years I do not believe they have implemented any of my feature requests. It is a shame because many of their new features seem to have a lot of potential, but after I get in and use. It feels a bit like Docebo is "nickel and diming." Some of the paid apps seem to be functionality that should be included in the basic subscription (eCommerce, gamification, having an https domain, etc.). If you need to get up and running quickly with an online training system, are okay with mediocre functionality, and want to use course content from their marketplace, Docebo is a good option. If you want a more powerful system and good support, then I do not recommend Docebo. User Review: "My experience with Docebo LMS"
We are a consulting company that represents Docebo in Brazil. We sell, deploy and support technically the platform for our customers. We have choosen Docebo after studying 4 or 5 similar solutions. Actually Docebo is used to support e-Learning projects for different types of demands and/or industries. Ease-of-use: very friendly, intuitive, simple processes for administration. Flexible and simple content publishing: easy to manage learning plans, upload learning content in several formats, assessment/testing creation/control. Modular features: allow to activate/dactivate features, some of them are paid. Very useful to set up the platform accordingly. I believe the pricing positioning could be improved, specially to support projects with more than 350 active users. It would be great if the product had an integrated authoring tool to create more compelling learning content inside the platform. Today it is possible to convert PPT files or upload videos. The Brazilian Portuguese version could be improved. It is possible to apply adjustments using the translation tool, but a few resources are always in English. Extremely well suited for simple projects, when the customer process is simple or there is no process. It is less appropriate for complex projects, when software customizations may be needed (they are possible but costs may increase a lot). 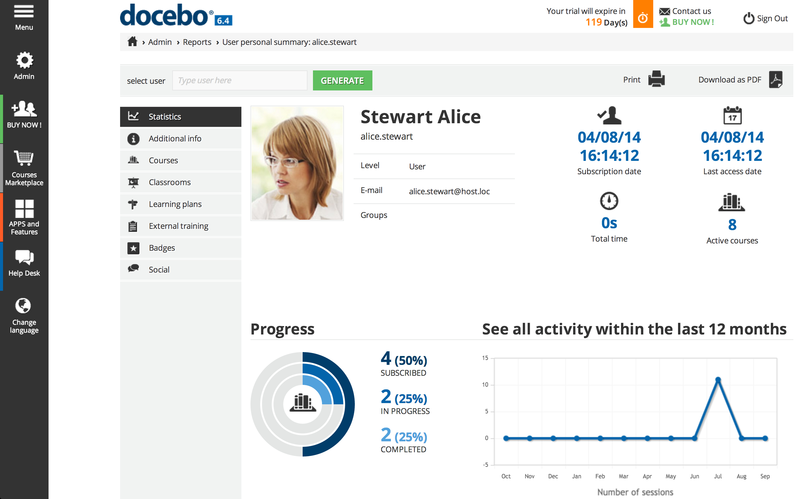 Docebo is a SAAS/Cloud platform for e-learning, also known as a learning management system. Docebo is available in 30 languages. While the primary users of Docebo are midsized companies, it is also assessable for large companies and SMEs.